"This is my Circus; These are my Monkeys: Crafting Multi-character Scenes"
PPWC: 2019 marks the 27th annual conference, so you’re invited to join us for a chance to learn more about the craft and business of writing as well as a chance to meet with editors and agents. This workshop will discuss the how/why of creating realistic minor characters who enrich your stories and give depth to your character and your fictional world. Using examples from Moonstruck, we’ll learn that minor characters should not exist in a vacuum, but rather they should behave as if they have a full, rich life outside the pages of the scene/book. In this presentation, we will delve into the crowded scene to determine why these scenes increase tension, build suspense, create conflict, and change the direction of the story. Using examples from Ernest Hemingway, Virginia Woolf, JK Rowling, and Jane Austen, we’ll discuss and enumerate the necessary techniques used to craft a successful multiple-character scene so the reader doesn’t get lost and close the book before it’s finished. Support local writers, writing communities, and the Friends of the Library... and learn cool stuff. Library peeps are some of my favorite people on the planet. While I was finishing my graduate degrees, I worked part time at PPLD, and found them to be the most highly intelligent, funny, well-read, and all around gracious human beings. My earlier books all acknowledge the assistance library people have provided to me, from being Beta Readers to looking up my weird and random writing research questions. So when I have a chance to do anything with or to benefit my local library, I do so. There's always a book-signing involved, and a portion of the proceeds goes to benefit the Friends of the Library. I'll be there signing, so come stop by if you can. Mountain of authors is one of my favorite events, because I get to see my library peeps, local writer friends I sometimes don't see for months at a time, and listen to a really cool Keynote Speaker. Below is a video of our 2018 Keynote. It's nice someone is living the writing dream. Seriously, you have to listen to understand what a cool writing life Kevin J Anderson has lived. Real life. Easy to write, right? Open the laptop. Type. But wait, is something missing? Order from chaos. While our lives follow a series of random events, memoirs and essays that want an audience do not. This plotting workshop for nonfiction (memoir, personal essay, and creative nonfiction) utilizes fiction plotting devices to take memoir and personal essay to the next level. Designed for all levels. During the Colorado Christmas Fair at the Denver Mart, Cindy will be manning the Colorado Author League booth (dates & times TBD) and signing books. For more information about the fair, see the event website or Colorado Author's League. On Saturday, October 27, 2018, Cindy will be one of three featured authors to speak at the American Association of University Women (AAUW)'s Author's Day. Her speech incorporates elements of the Year of Living Fearlessly into a keynote address: No Such Thing as an Easy Button." Tickets are $40. Proceeds benefit the AAUW scholarship fund. For more information, contact the American Association of University Women. In addition, you can monitor the Facebook event for further details. Get Lucky in Love: Looking for your next book boyfriend? Find him in one of these great summer reads. My sprint partners and I all have releases this summer, and we're celebrating with the Lucky 13 Giveaway. From June 13 (Bethanne's release) to July 13 and we're giving away 13 total prizes. One lucky winner will receive an 8MB Kindle and 4 winners will receive 3 books each (one from each author). Get ready, because Mick Donovan is your next bad boy book boyfriend, and ladies- you will LOVE him! Bad boy Mick Donovan is out to avenge his brother’s death, and aligning with Destiny Harper and the FBI Task Force is his ticket. But landing in the mountains amidst a blizzard and a past Dez would rather forget tests what Mick will sacrifice for revenge. To enter, just help us spread the word about UNSTOPPABLE!! Coming soon. Contact Indie Sage to join the Release Tour. Splashes Into Books "This is another superb read by this highly talented romantic suspense author. There’s danger, gangsters, bullies and dealers as well as support, family, love and romance. I’d love to see this as an action packed film!" Book Magic "The perfect combination of romance and suspense." Books & Spoons: "Rough, raw, and edgy... a great, chilling yet entertaining ride." All Things Bookaholic, "The perfect mix of romance and suspense." Nikki's Book Nook, "Fast paced, engaging, laugh inducing, toe-curling passion and a HEA to satisfy my little romantic soul! Brilliant read!" Fresh Fiction, Post: "Top Fiction Set in Colorado"
The Crafty Engineer’s Bookshelf, Review "One of the best romantic suspense books I have ever read." Devilishly Delicious Book Reviews, "It’s the perfect combination of spice, sweetness, and action!" The Power of Three Readers "It starts out with bang, and it never slowed down." Congratulations to Angela F for "Win my TBR" list. 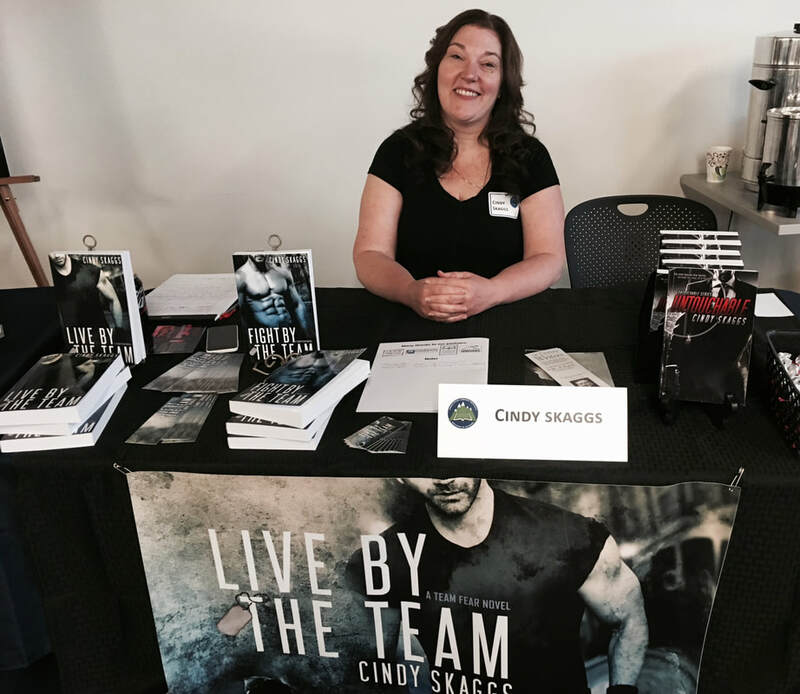 One winner will win a total of 4 e-books (Brighter Than the Sun, Shadow Dance, Troublemaker, Deadly Silence) plus 1 copy of Live By The Team by Cindy Skaggs. Three other winners will receive Live By the Team. The winner's list will be posted on my website. Winners will be contacted via email on the Monday following their win. Pretty Sassy Cool, AN UNTOUCHABLE CHRISTMAS Interview... Fun! For the full release kit, download the MS Word file to the left. Congratulations to Amy H for winning the UNFORGETTABLE book release giveaway for a $15 Amazon Gift Card. Congratulations to ERIN F for winning the UNTOUCHABLE CHRISTMAS book release giveaway for a $20 Amazon GC. Congrats to Karen M. who won the FIGHT BY THE TEAM release Rafflecopter. Congratulations to Lisa L who won the $25 Amazon gift card for my LIVE BY THE TEAM release party. Congratulations to Tiffany M who won the Goodreads signed copy of Live By The Team on 5/18/16. A great writer event. Hear great panel discussions on Mystery books/writing and Keynote speaker Anne Hillerman. I will be there as a Showcase Author! At the book signing from 4-5PM will be the one and only place to get a signed copy of my newest book which releases 4/23/16! Creative Magazine Radio Show recently interviewed me on their weekly radio program on creativity. I might sound like a complete idiot, so you should listen before I beg him to destroy the replay podcast. First broadcast is Thursday, February 11 @ 1pm on 93.9 FM. Or visit the website after for a listen to the podcast.